The smartphone has become the command center for much of your life. But while it can serve up alerts about upcoming meetings or help you book a flight, it doesn’t know much about what’s happening back at your house. Did you leave the oven on? Did someone just open the garage door? A Cambridge startup called Sense Labs wants to plug in to one of the dumbest parts of your home — the circuit-breaker panel — and extract information about what’s going on under your roof. The cofounders of Sense Labs, Michael Phillips, Christopher Micali, and Ryan Houlette, all worked together at Vlingo, a startup that helped pioneer talking to your smartphone — before Apple introduced Siri. After some legal squabbling over patents, Vlingo was acquired in late 2011 by Burlington-based Nuance, the biggest independent player in speech recognition. In 2013, the trio helped found a startup, then known as Sage Devices. Earlier this year, a regulatory filing divulged that the company, renamed Sense Labs, had raised $2.5 million. And similar to the way that smartphones can now understand spoken commands — some of the time — Sense Labs is designing a device that links to your home’s main electrical feed to understand what appliances and systems are on, and how much power they’re using. (The company’s software interprets the different signatures of the plugged-in things around your house that sip or guzzle electricity.) 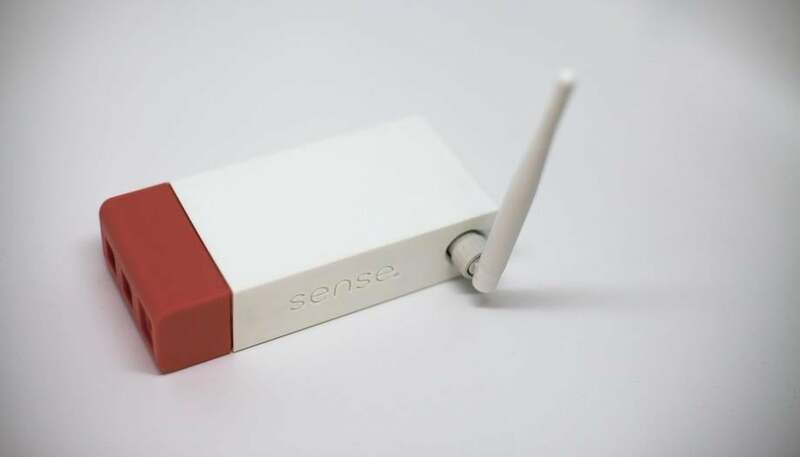 It sends alerts to a Sense app on your phone. That lets you know, for instance, that the washer cycle has just ended, or that the oven has been left on. Another data point it can collect: How often is the TV on? It also lets you see energy usage trends over time, for individual appliances. By comparing the way your appliances consume power to those of other Sense users, CEO and cofounder Michael Phillips says, it could persuade you that it’s time to upgrade to more energy-efficient models. The company also is exploring whether its software, designed to read electrical signals to know what appliances and devices are being used, might also be able to anticipate when an appliance is on the verge of breaking. The company is selling its monitoring system for $199, and says shipments to “early adopter” customers will start in mid-November. “We’re trying to get the first versions of these out there, and get feedback about what people want to use it for,” Phillips says. The system can be installed by a homeowner, but Phillips says he expects most people to have an electrician set it up. And he says the system will need a little bit of training; it may not correctly identify some appliances the first time, and users may need to correct it about when a space heater is on, versus an iron, for example. Sense has about a dozen employees; half of them are veterans of Vlingo, Phillips says. In total, the company has collected about $5.6 million from investors, including CRV, Prelude Ventures, and Capricorn.